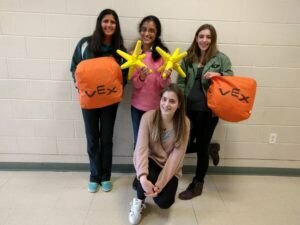 The REC Foundation recently caught up with Melissa, Sofia, Janvi, and Parima with the Hopkinetics, Hopkinton High School’s VEX Robotics Competition Teams 2602A & B, to discuss Girl Powered. The girls hold a variety of roles on the teams with Melissa as the team builder and designer; Sofia, also a builder; Janvi an amaze and design lead; and Parima, a STEM research lead. Each of the girls shared how they joined the team, what they enjoy most about robotics, and their perspective on engaging more young women in STEM and robotics. “I became interested in robotics because I was part of the science fair and I really enjoyed the process of trying to come up with ideas and put them into action to solve a certain task,” said Parima. “For me a highlight of the season involved finishing the chassis and finalizing the design for the arm of the robot,” said Parima. “This season we’ve learned to work well not only as a team, but also between different teams. It has thus been much more about empowerment and teamwork than competition and rivalry, which is one of the most important things to look for in a good club,” added Janvi. Each of the girls spoke about how they came to be interested in robotics and what inspired them to continue. Specifically, a few mentioned how female role models help encourage girls. “I have been very inspired by my mom, she has always worked extremely hard and has shown me that you can always change your career instead of being forced to have the same job for the rest of your life,” said Melissa. Sofia shares her passion for robotics with her five older brothers and hopes to explore a future in biomedical engineering. “I think more support for female robotics groups would be wonderful, especially as some girls are afraid of being taken over by other boys on the team,” said Sofia. “I feel that there is a fear that because you have never done this before and that the people there are mostly boys that have been involved with robotics for years, you will be judged, alienated, or even just left out,” said Melissa.